Because I’m feeling lazy, we’re gonna reach for a boxed soup kit today. Matzo ball soup to me always means happy memories. This ranks amongst my fav soups of all time. Right up there with a good tomato soup. Why am I obsessed with tomato soup? Broccoli cheddar. Potato. Mmmm, soup. 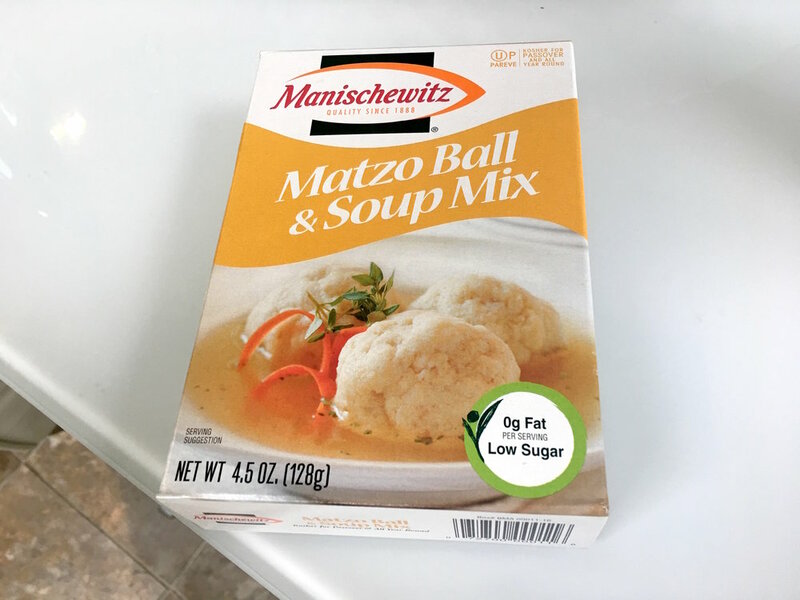 I stopped myself because the original plan was to title this “Matzo Ball Soup for the Lazy Dweebs Who Don’t Feel Like Ordering It At a Cafe.” Though boxed, making this took a lot of work. The many minutes spent preparing it created a luxurious soup unmatched by no canned soup on earth. You really should invest the time involved. Worth it! The Manischewitz website has more recipes if you’re into cooking and foodie stuff. Their sweet potato chili recipe looks fantastic. The Midwestern attitude is “whatever you can dump into a soup, dump it.” Peas and carrots were tossed in. Voila! Three containers of matzo ball mix went into this awesome soup! Netflix and Chill #2: "The Kissing Booth"